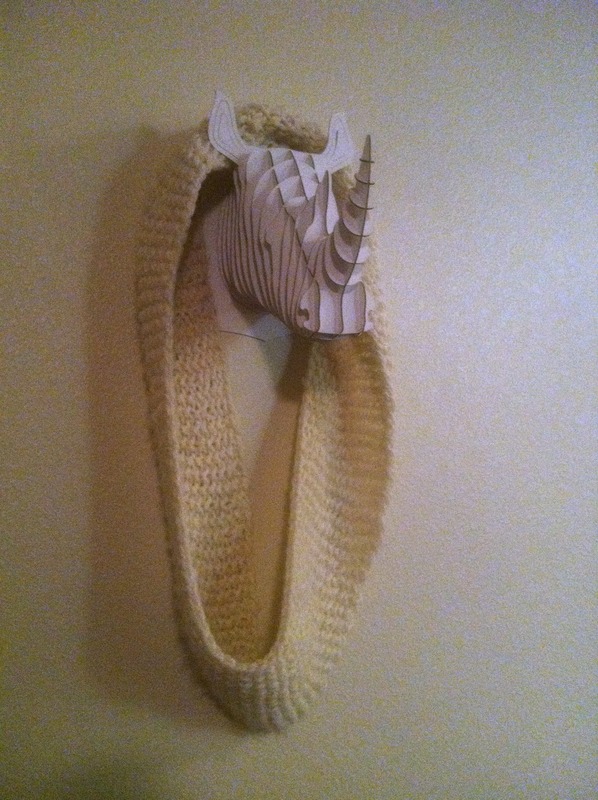 The cowl I wrote about last time, modeled by my lovely but unnamed Rhino. For the past couple of weeks, I’ve stared at the bottom shelves of my bookshelf. I’ve wondered, could I put my stash there? Will my husband freak out if I do? What if I did it anyway? So, last night, I decided to do it. Since the move, my stash has lived as a tangled mess in big blue containers. It’s really disgraceful the way I’ve treated that yarn. 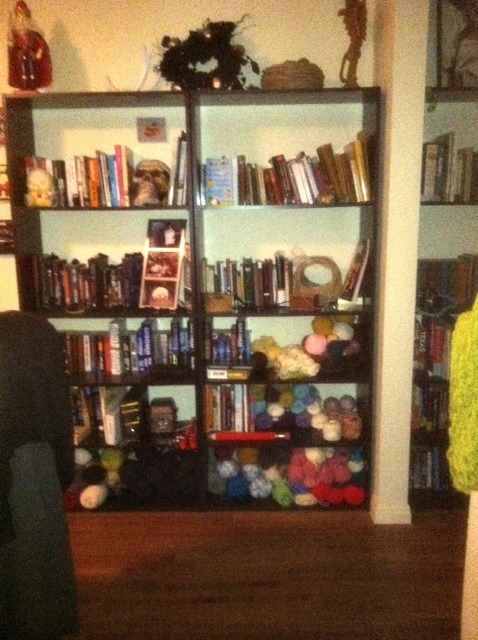 Last night, I pulled out the containers, wound the yarn into balls (my least favorite thing to do), and arranged them on my bottom shelves. On the left, we have my bulky and special yarns. Bottom right are the worsted weight skeins. Just above that are the Sugar n’ Cream set, super fine weight yarns, and sock yarns. Just above that are already wound balls of yarn and a tangled mess of Simply Soft in cream. As I’m a stash knitter, this helps me see what I already have so I can plan my projects a bit better. I think I’ll be working off of the worsted for quite a while. Also, I can’t for the life of me remember why I bought so many Sugar n’ Cream bits. I can’t remember what I had been planning, but they must’ve been on sale. After all of this, a revelation hit me last night. I’ve written about the herringbone cowl I tried to make, failed, and then subsequently despised. Well, Malabrigo is an expensive yarn, at least for me. I paid about $10 a skein for that. Looking at that failed project, a random thought floated through my head. Rip it out. I tried to avoid the idea for a while, but it just kept coming back. I should rip it out. That’s exactly what I did, and I’ve never felt better. Knitting isn’t like editing. I send a book out there and there are no take-backs. It’s out there. With the cowl, I saw errors, and I was able to undo the whole thing. I could take back the yarn I had put into it and hopefully re-purpose it for something better. It was thrilling and somewhat therapeutic. I’m very glad I did it. I’ve also decided, through the course of it all, to set up a knitting calendar. I like having a bunch of projects going at once; it keeps me from getting bored. The problem is, I don’t have a lot of time then to devote to anything. I was thinking I could take my projects and divide them out across the week. That way, each project gets attention and I still won’t get bored. I may pursue this yet. On the needles: Little brother’s beard is still in progress. Or rather, it hasn’t gotten any bigger. The blanket is a couple rows longer, but the stash reorganization distracted me last night. The new addition is the sock. I’m trying the toe-up sock again! I’m behind in my 52 socks in 2012 project, so I need to successfully make a pair of socks to get back on track. I cast on the toe this morning (magic cast-on, so easy), and I will work on the increases today. Hopefully this one won’t have as many holes as the last attempt did. Your idea for a knitting calendar is great! I may have to steal it. It fits right in with my desire to make lists of everything.